The influence of Benedictine monasteries on the creation of western civilisation is a solidly established fact of history. After the fall of the Roman empire, and the ensuing decadence that led through what has come to be called the “Dark Ages”, Benedictine monasteries became centres not only of prayer, but also of learning and civilisation. In the silence of their cloisters, the monks maintained the culture, both secular and religious, of the ancients and passed it on to succeeding generations until the great universities were established in the high Middle Ages, making it then possible for the expansion of culture at the time of the Renaissance. 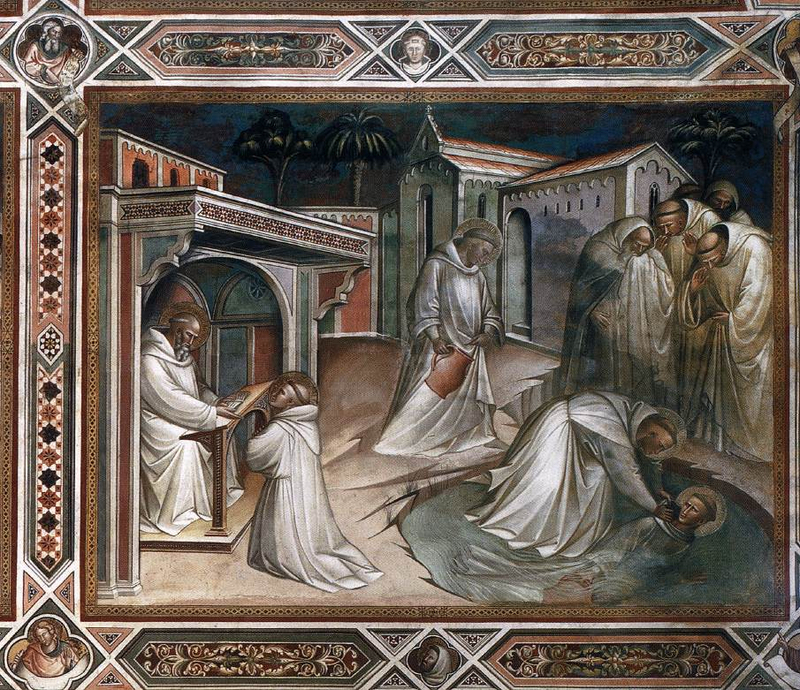 Many have pointed out the similarities of our time with that of St Benedict. The pax romana which had guaranteed a peaceful coexistence and prosperous undertakings for centuries, was gone, dissipated by the invasion of the barbarians from the north, and causing the total breakdown of the order that had reigned theretofore. Today, the values of our western Christian civilisation, which continue to have some influence, are fast vanishing, leaving our society prey to new ideologies which differ from barbarianism only in their stealthiness in imposing new structures through fallacies of the mind rather than through the force of arms. In that context, may we not think that the role played by monks in the early Middle Ages may still be played today? Would there not be something to be said for the value of the Benedictine life and its capacity to harbour the treasures of our heritage in the silent, hard-working context of contemplative life? 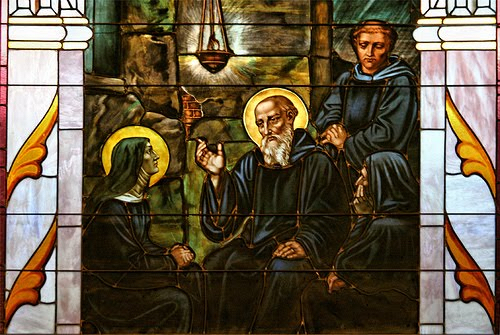 To understand this better, it would be useful to have a more complete understanding of what Benedictine life is and, to that end, go back to the beginning, to St Benedict himself and the life he lived and taught his disciples. 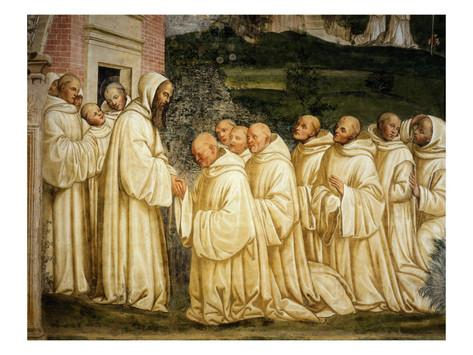 St Benedict defines his monastery as, quite simply, a “school of the divine service” - divini schola servitii. It is the school in which one learns to serve the Lord, to be disciples of the Lord. That of its very nature can only be a source of peace, for by the very fact of focusing his attention on the Lord of all, on “our Father who is in Heaven”, the monk or nun is exerting a profound influence on a world that continues to break up, to dissolve itself into factions, the unavoidable pitfall of a society which no longer has the saving moors of a stable tradition as point of reference. Learning to serve the Lord in the monastery involves essentially two things, which have come to be known as the Benedictine motto: ora et labora - pray and work. Benedict, whose only desire, according to St Gregory the Great, was to please God (soli Deo placere cupiens), tells his monks that they must prefer nothing to the love of Christ (nihil amori Christi praeponere). Such desire for God and love for Christ gives direction to the monk’s life, orients it continually towards our final goal. Preferring nothing to the love of Christ means that Christ is loved above all things; it also means that the human heart finds in love for Him the stability, the point of reference, the anchor which allows it to subordinate all other loves to it. If the monk’s heart is solidly established in Christ, he can then love others, all others, with the very love of Christ, without the risk of these other loves causing prejudice to the unique love of his life. Loving Christ above and in all things also entails spending time with Him. And so it is that love for Christ gives shape to the everyday life in the monastery. Even though St Benedict did not invent the eight-fold prayer of the divine office (Matins, Lauds, Prime, Terce, Sext, None, Vespers, Compline), his legislation in the Rule did set the standard for all subsequent legislation in religious orders. Eight times a day — the first being in the final hours of the night, — the monk goes to choir, where he offers his mind and heart and body to the Lord of all things, proving by his deeds that God is his all. It is not possible to overly stress the importance of this when one considers the role of the liturgy in the Church. If it is true that the Holy Eucharist is the source and summit of the Church’s entire life, and if the various hours of the Divine Office are like the rays of that Eucharistic sun which shines over the life of the Church, it can only be the case that Benedictine monasteries have contributed not a little throughout the centuries to giving form to the Church in its most sublime aspect: a city built on a mountain gathered around its Lord in prayer, receiving from Him the light which it then radiates over the rest of the world. The centrality of the Divine Office throughout the day, with the apparent loss of time it involves, is the most important manifestation of the otium sanctum, the “holy idleness” so dear to our fathers and fundamental not only to monastic life, but to any life in the spirit. Whereas our modern technological era makes it more and more difficult for the mind to rest in thoughtful appreciation of reality, our ancestors knew how to “stop and smell the flowers”, to make leisure time in which one could pray and meditate, all indications of a healthy society in which the supreme value is not material production but spiritual progress, not doing but being. The focus on the Sacred Liturgy in the Benedictine Tradition goes hand in hand with lectio divina. This “reading of divine or spiritual things” includes first and foremost the Holy Scriptures themselves but also all that it has inspired, such as the commentaries by the Fathers of the Church as well as everything that prepares the mind to understand it and profit from its lessons. St Benedict reserved several hours a day for this activity. He clearly wanted his monks to be well-read, well-instructed, well-armed to practice their profession of singing the praises of God. In prescribing this attentiveness to the content of Divine Revelation, he was not only giving them the materials to nourish their own life of contemplation, but he was also equipping them to become experts in the ways of God, to teach others, to preach the Gospel. It is no surprise if the Benedictine Tradition very quickly gave rise to exceptionally gifted spiritual guides, preachers, apostles and missionaries. The other half of the Benedictine motto is “labora”. St Benedict specifies that “Idleness is an enemy of the soul; and hence at stated hours the brethren ought to occupy themselves in the labour of their hands” (Rule, ch. 48). He goes on to prescribe just how much time is to be devoted to this labour according to the diverse seasons of the year. Thanks to manual work, the monk conforms himself to the example of the Apostles, St Joseph, nay Christ himself, obeying the common law and preaching the dignity of humble work by which man is associated with the work of the Creator. He finds therein the sure and excellent way of self-denial and humbly takes part in helping the monastery provide for its needs and those of the poor. Manual work also teaches the monk solidarity with all the working sectors of people and makes him personally experience what it means to earn a living. It is easy to see how such an ethos of work has contributed to building up Western civilisation and to this day inspires solidarity among various classes of people. 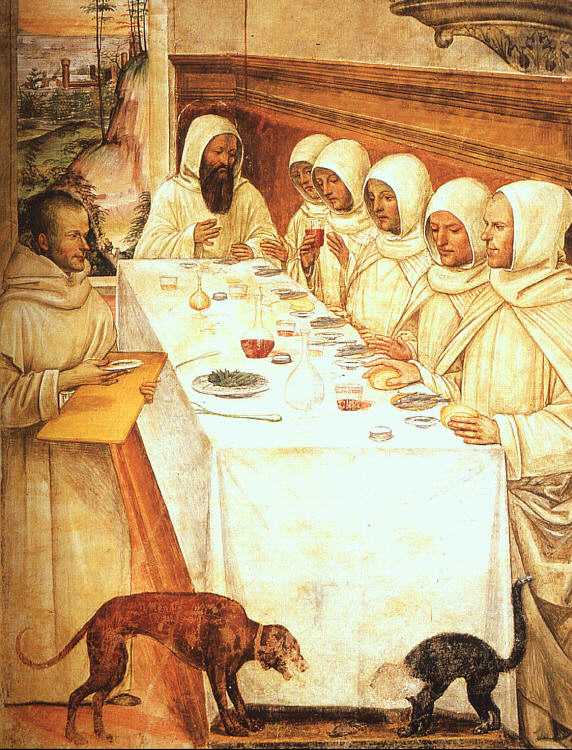 Perhaps this is one of the aspects of the monk’s life which favoured in a special way the implantation of monastic communities in missionary countries: the monks, being men of work, not only gave the good example of making a living for themselves, but also taught the people of other countries the skills they had developed in Europe. ourselves some healthy form of work adapted to our capacities. Such a philosophy of work, inspired by the Gospel and implemented by monks throughout the centuries, is one our world is in dire need of. “Work, and be sad no more”. Man was created in a garden, one he was commissioned to cultivate, and so it is that man must busy himself in tranquillity with healthy work if he wishes to be happy. carried through to our own day. Many are those today who are opening their eyes to a terrifying reality: modern man has lost his way; humanity itself seems in dire peril of ceasing to be human. Having lost contact with who he really is, with what makes up his own God-given nature, he is in real danger of destroying himself. As Pope Benedict XVI once put it, having removed God from his horizon, man can only come up with recipes for destruction. And that is precisely why we need a recipe for reconstruction. St Benedict, his Rule, his community life, his divine liturgy, are invaluable for helping man rediscover who he really is. Man — body and soul —, placed in a universe that unites matter and spirit, can only achieve the fulfilment of his nature by taking the full measure of what it means to be both corporal and spiritual. And this is admirably done in the very structure of Benedictine monastic life. We live in common to help each other; we pray in common to encourage each other in our pursuit of God; the other is there to help us as we trod our personal path, and we are there to help the other in his. “A brother that is helped by his brother, is like a strong city” (Prov 18:19). The very organisation of daily life in a monastery, with its attention to details that a man needs to be able to rely on, the delicate attention paid to each other, and the paternal guidance of the father of the community who watches over all so that all may be at peace and glorify God while saving their souls, such are the most fundamental aspects of the life which reaches its climax in the communal celebration of the Divine Office. No doubt about it, St Benedict is relevant to our times, just as in the VIth century. He still offers his monasteries as havens to men and women who really seek God, want to save their souls in eternity and find peace here below. This young man who left the world to save it, becoming founder of monastic life in the West, magister of civilisation, and herald of the Christian religion, is also a messenger of peace, divine peace, which exudes from his person and his true sons and daughters. Peace – Pax, that other great Benedictine motto –, is the fruit of a life lived within the harmony willed by God, a life which creates peace and harmony for others, moulds unity in families and among peoples. Is there any more urgent need today?